A family’s company is typically its most important asset and dominant activity. While central to a family, its company is only one aspect of what a family holds dear. Professor John Davis developed the concept of the family enterprise to describe the full scope of activities that families engage with the activities that define them, that shape them and that they perpetuate. 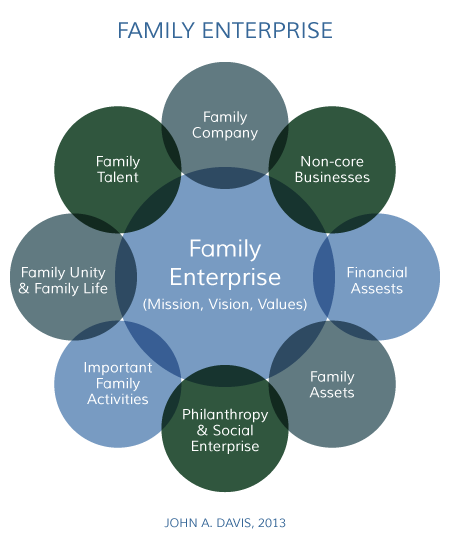 When families enlarge their lens to take into account all activities in the family enterprise, it allows for more thorough, coordinated strategies and long-term continuity. A family enterprise is the collection of a family’s meaningful activities and economic interests that help to identify, support and unite the family. These activities need to be well led, managed and governed so that problems do not spread to other activities or to the family itself. The objective for a family is to organize and manage its family enterprise so that the entire enterprise is productive, meets the goals of the family and can be continued into the next generation. Once families define their family enterprise, they begin to understand their family mission as extending beyond the family business. You can’t inherit a vision.